Back in February we released an all new version of Get It Done (more info). Since many of our improvements apply to both our apps, we will be combining Get It Done and Manage It news in the same newsletter. Let us know what you think! We will be denoting which app this refers to by putting MI (Manage It) or GID (Get It Done) next to it. You can now email an individual task and its notes to yourself or someone else. Then enter the email address of the person you'd like to send the task to and click "Email Task". Simple enough! The recipient should get the task details such as title, notes, due date... Give it a try and let us know what you think. You can also email an entire list of tasks out of Get It Done. NOTE: We only send what is visible in the list. So if the list filter is set up to only showing "Active Tasks", the email will only include unchecked tasks (completed tasks will be ignored). We have been making improvements to how you move tasks in Get It Done. 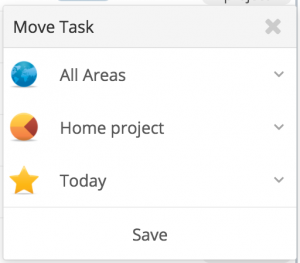 We simplified the "Move" dialog so that it is quicker to move your tasks. We are still making improvements to this dialog so stay tuned for a few more tweaks to make this even better. From your valuable feedback (thank you! ), we improved the search dialog in both apps to make it easier for you to filter your results by completed, active, or all tasks. Additionally, you can search in title, notes, or both. Just click the buttons under the search field to refine your results. We made a number of improvements over the past month to repeating tasks. For example in Get It Done, you can now specify which project or focus the new recurring task is put in. We've also fixed a number of bugs involving recurring tasks in both apps. For those of you who export your tasks to a spreadsheet, we improved the output for some of the columns and we also added more fields to the spreadsheet. All of these improvements came from customer suggestions so keep the feedback coming! Printing individual tasks looks much better now. Just open the task and click "Print..." in the "More actions..." menu to print a task. Last but definitely not least, you can change the date format for both Get It Done and Manage It. This is a highly requested feature for anyone not living in the USA. To change your preferred locale, open the Settings of the app, click on "Profile" then change your "Language / Locale". Hopefully we made you just a little more productive this month. As always, please send any questions or comments our way.